Catalan leader Carles Puigdemont says the Spanish region has won the right to statehood following a contentious referendum that was marred by violence. He said the door had been opened to a unilateral declaration of independence. Catalan officials later said 90% of those who voted backed independence in Sunday's vote. The turnout was 42.3%. Spain's constitutional court had declared the poll illegal and hundreds of people were injured as police used force to try to block voting. Officers seized ballot papers and boxes at polling stations. "With this day of hope and suffering, the citizens of Catalonia have won the right to an independent state in the form a republic," Mr Puigdemont said in a televised address flanked by other senior Catalan leaders. "My government, in the next few days will send the results of today's vote to the Catalan parliament, where the sovereignty of our people lies, so that it can act in accordance with the law of the referendum." He said the European Union could no longer "continue to look the other way". In another development, more than 40 trade unions and Catalan associations called a region-wide strike on Tuesday due to "the grave violation of rights and freedoms". Earlier, as voting ended, Spanish Prime Minister Mariano Rajoy said Catalans had been fooled into taking part in an illegal vote. He called it a "mockery" of democracy. "At this hour I can tell you in the strongest terms what you already know and what we have seen throughout this day. There has not been a referendum on self-determination in Catalonia," he said. Large crowds of independence supporters gathered in the centre of the regional capital Barcelona on Sunday evening, waving flags and singing the Catalan anthem. Anti-independence protesters have also held rallies in Barcelona and other Spanish cities. How bad was the violence? The Catalan government said more than 800 people had been injured in clashes across the region. Those figures included people who had suffered relatively minor complaints such as anxiety attacks. The Spanish interior ministry said 12 police officers had been hurt and three people arrested. It added that 92 polling stations had been closed. In Girona, riot police smashed their way into a polling station where Mr Puigdemont was due to vote, and forcibly removed those inside. Mr Puigdemont voted at another station. The BBC's Tom Burridge in Barcelona witnessed police being chased away from one polling booth after they had raided it. TV footage showed riot police using batons to beat a group of firefighters who were protecting crowds in Girona. Thousands of people in Catalonia are rallying and blocking roads in protest over Spanish police violence during Sunday's independence referendum. There is little public transport across the region, after local trade unions called a strike. Barcelona's port was at a standstill, union sources said. Almost 900 people were hurt as police tried to prevent the vote. Thirty-three police officers were also injured. The central government in Madrid said the referendum was illegal. 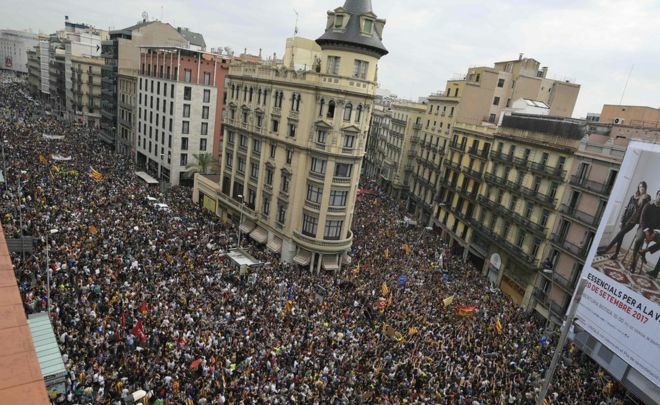 On Tuesday, about 300,000 people took to the streets of Barcelona, city police were quoted as saying by the AFP news agency. Some demonstrators were marching towards the Catalan parliament. More than 50 roadblocks in the city caused big traffic jams. Barcelona's metro traffic was cut to a 25% service during rush hour and no trains at all at other times. Top tourist attractions were also closed, including the city's famous Sagrada Familia church. Mercabarna - Barcelona's massive wholesale market - was left deserted as some 770 food businesses closed for the day. However, the city's El Prat airport and its taxis are operating normally. Protest rallies are also taking place in other major cities and towns of the north-eastern autonomous region. Many small businesses have shut for the day. Schools, universities and medical services are also closed or operating at a minimum level. The strike was called in protest at "the grave violation of rights and freedoms" seen during Sunday's ballot. Spanish Prime Minister Mariano Rajoy has said the vote made a "mockery" of democracy. On Tuesday, Spanish Interior Minister Juan Ignacio Zoido said: "We see how day after day the government of Catalonia is pushing the population to the abyss and inciting rebellion in the streets." He also warned that the central government would take "all measures necessary to stop acts of harassment". Meanwhile, Deputy Prime Minister Soraya Sáenz de Santamaría condemned the "mafia" behaviour of those protesters who had earlier gathered around hotels housing Spanish police officers and demanded that they leave. On Sunday, more than 2.2 million people reportedly voted in the referendum. The Catalan government says the vote in support of independence was nearly 90%, but official results have not yet been released. Turnout was relatively low at a reported 42%, potentially weakening the position of Catalan President Carles Puigdemont. On Monday evening, the Spanish national football team abandoned a training session in Madrid after fans booed and whistled at defender Gerard Pique, who has strongly backed the Catalan referendum. Guardia Civil police mingled among the crowd, as some fans waved Spanish flags and anti-Pique placards. Pique plays for FC Barcelona, which announced that it had joined the strike. "None of the professional teams or the youth teams at FC Barcelona will train tomorrow," the club said on Monday evening. Drumbeats thunder and echo up and down Laietana Street, where last night's anti-police protest of hundreds outside the city's National Police HQ has swollen into a roaring human river above which bob the lone-star flags of Catalan independence. As a surveillance helicopter's blades beat time overhead, vans of the local Mossos police slowly negotiate the alleys as the force fulfils its peculiar role as both guardians of their national colleagues, and heroes of the crowd who cheer and chant: "Our police are here." "It's more than a flag, it's like a feeling," says Roger Mayor, 18, as his friends show off the flags they are wearing. "We think the Spanish government just want us for the money and they hate us. The Spanish police actions on Sunday were surreal. It felt like being in a horror film. We spent all day in a school [polling station] and we were very scared, though the police didn't come." Xavi Alba, 28, and his mates pass by with a shopping trolley draped in the Catalan communist flag as the crowd chants: "The street will always be ours". It's stuffed with beer mostly, he explains while drinking a can. "We go around Barcelona occupying the streets to protest at the repression. It's not about independence, it's about democracy. When we see people with Spanish flags, we just hug them. Yeah, they hug us too!" Meanwhile, political leaders are trying to find a way forward. Mr Puigdemont has said he wants a new understanding with the central government in Madrid, but the Spanish government has warned it could suspend autonomy of the wealthy north-eastern region. In his first interview since Sunday's referendum, Carles Puigdemont said his government would "act at the end of this week or the beginning of next". Meanwhile, Spain's King Felipe VI said organisers of the vote put themselves "outside the law". Hundreds of thousands of people across Catalonia have been protesting over Spanish police violence during the vote, during which nearly 900 people were hurt. During the vote, 33 police officers were also injured, local medical officials said. In the BBC interview, Catalonia's President Carles Puigdemont said his government would "act at the end of this week or the beginning of next". Mr Puigdemont said there was currently no contact between the government in Madrid and his devolved administration. He disagreed with the European Commission's statement on Monday that events in Catalonia were an internal issue for Spain. He was speaking shortly before the king's speech. In his televised address to the nation, the king said the Catalan leaders who organised the referendum showed their "disrespect to the powers of the state". "They have broken the democratic principles of the rule of law. "Today, the Catalan society is fractured," the king said, warning that the poll could put at risk the economy of the wealthy north-eastern region and the whole of Spain. But he stressed that Spain "will overcome difficult times". The central government has described the referendum as illegal. Re: Catalan: Region's independence 'in matter of days"
Catalan leader Carles Puigdemont has attacked Spain's King Felipe VI for "deliberately ignoring millions of Catalans". In a TV address, Mr Puigdemont accused the king of adopting the Spanish government's position. "This moment calls for mediation," he said. He has indicated that Catalonia could declare independence next week. King Felipe made his own TV address on Tuesday night, calling Sunday's Catalan referendum illegal and undemocratic. Twenty-four hours later, Mr Puigdemont claimed that the king had rejected a moderating role granted to him by the Spanish constitution. Mr Puigdemont told the BBC on Tuesday that he would declare independence "at the end of this week or the beginning of next". The Catalan government has said there will be an extraordinary meeting of parliament on Monday to discuss the outcome of the disputed referendum. While Catalan officials put the vote in support of independence at nearly 90%, final results have not yet been released. The turnout has been estimated as 42%. In his statement on Wednesday evening, Mr Puigdemont did not give any further details of a possible declaration of independence. Switching to Spanish from Catalan, he thanked Spanish citizens who had sent their "solidarity" to Catalonia. The Catalan leader has previously called for mediation, but the Spanish government has rejected any involvement of third parties. It was a rare public attack on the Spanish monarch but King Felipe himself, symbol of national unity, seldom addresses the country on TV, and President Puigdemont had to respond. At a bar in the Catalan leader's home region, they clapped respectfully afterwards, happy with their leader and his call for mediation, and then they joked about the Game of Thrones TV series. "We need a king like Jon Snow who tries to keep his lands together and is with the people," said one woman, laughing. Prime Minister Mariano Rajoy, by common agreement, was the Night King, wishing eternal winter on Catalonia. "I want a Spain that cares for all its cultures," she added more seriously. "Why not love them all? We don't understand the speech of Felipe VI." Spain's Constitutional Court has suspended next Monday's session of the Catalan parliament, in a bid to pre-empt a possible push for independence. Earlier Prime Minister Mariano Rajoy warned Catalonia's regional government against declaring independence after a disputed vote last Sunday. The court's ruling on Thursday upheld a challenge not from the government in Madrid, but by the Socialists' Party of Catalonia, which opposes secession from Spain. The socialists won almost 13% of the vote in the 2015 election, and has 13 MPs in the 135-seat regional parliament. 1 October: Catalonia holds banned referendum on independence, defying Spanish government and a Constitutional Court ruling; Catalan leader Carles Puigdemont says the independence camp has won. 2 October: The European Commission says it regards the referendum as illegal and an independent Catalonia would be outside the EU. 3 October: In a TV address, King Felipe said referendum organisers had showed their "disrespect to the powers of the state" and broken the rule of law. 4 October: Mr Puigdemont says a declaration of independence will come within days; the government says it will not give in to "blackmail"
5 October: Spanish PM Mariano Rajoy urges Catalan leaders not to declare independence. Constitutional Court bans session of Catalan parliament due on Monday. Also on Thursday, the board of Sabadell, a major bank, decided to transfer its headquarters from Barcelona to the south-eastern Spanish city of Alicante. CaixaBank, another large Barcelona-based institution, is reported to be considering a similar move. This would ensure the banks remained within the eurozone and under the supervision of the European Central Bank. Mariano Rajoy is famous for his "wait-and-see" attitude in crises. He's more of a technocrat than a passionate politician. So far, it's served him well. While not wildly popular, he remains very much in control of Spain's central government. But the Catalan question is risky for him. His apparent inertia this week is coming under fire from the Spanish left - who want him to start a dialogue with Catalan separatists - and the harder right who want him to take immediate action, shutting the Catalan government down, bringing the reins of power back to Madrid. Spaniards call it "the nuclear option". In a nod to them on Thursday, Mr Rajoy warned of "greater damage" if Catalan separatists went ahead with a unilateral declaration of independence. Spain's constitutional court has now banned Monday's meeting of the Catalan parliament where that declaration was expected to be made. While this may appear a setback for the separatists, they have ignored court rulings before. But Mr Rajoy hopes the weight of Spanish law will now serve to divide Catalonia's pro-independence parties - which range from the moderate to the radical - and weaken their resolve. Catalan leader Carles Puigdemont is facing growing pressure to drop plans to break from Spain ahead of a key address to the regional parliament. There is speculation he may announce a unilateral declaration of independence following a disputed referendum. The mayor of Barcelona has urged Mr Puigdemont and Spanish PM Mariano Rajoy to "de-escalate" the crisis. Mr Puigdemont's address, which is due at 18:00 (16:00 GMT), comes after a vote was held on 1 October which Catalan officials say resulted in almost 90% of voters backing independence. Turnout was put at 43%. The vote was deemed illegal by Madrid and suspended by Spain's Constitutional Court. "No" voters largely boycotted the ballot and there were several reports of irregularities. National police were involved in violent scenes as they manhandled voters. Spanish Prime Minister Mariano Rajoy has given Catalonia's separatist leader five days to say whether or not he has declared independence. If Carles Puigdemont confirms by Monday that he has, he will be given a further three days to withdraw the declaration. Failing that, Madrid will invoke Article 155 of the constitution allowing it to suspend the region's autonomy and impose direct rule. 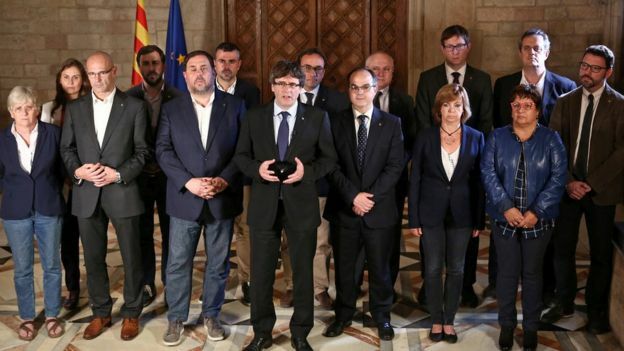 Catalan leaders signed a declaration of independence on Tuesday. However, they halted its implementation to allow for talks with Madrid. Spain has been in turmoil since the separatist government held a disputed referendum in Catalonia on 1 October which was declared invalid by the country's Constitutional Court. Almost 90% of voters backed independence with a turnout of 43%, Catalan officials say. Anti-independence voters largely boycotted the ballot and there were several reports of irregularities. National police were involved in violent scenes as they tried to stop the vote taking place. Mr Rajoy said his government had asked the regional government to clarify whether or not it had declared independence. He accused Mr Puigdemont of having created "deliberate confusion" and said he wanted to restore "certainty". "This call - ahead of any of the measures that the government may adopt under Article 155 of our constitution - seeks to offer citizens the clarity and security that a question of such importance requires," Mr Rajoy said. "There is an urgent need to put an end to the situation that Catalonia is going through - to return it to safety, tranquillity and calm and to do that as quickly as possible." Mr Rajoy was speaking after holding an emergency cabinet meeting on Wednesday morning to discuss the government's next steps. Speaking later in parliament, Mr Rajoy said Spain was facing the most serious threat to its 40-year-old democracy. He accused the separatists of hatching an "anti-democratic plan foisting their will on all the people of Catalonia", and said the Spanish government had had no choice but to restore order. "It falls to the Catalan leader to restore constitutional normality," he told deputies, rejecting any suggestion of outside mediation in the dispute. He added that he was willing to negotiate on the issue of regional autonomy and changes to the constitution - but this had to be within the framework of the law. Spain's prime minister tried today to put the ball back in the Catalan court. He has asked the Catalan president to clarify if he is making a declaration of independence or not. In the meantime, sources in the Senate (Spain's upper house of parliament, where Prime Minister Rajoy's Popular Party has a majority) say the request has been made to trigger Article 155 of the Spanish constitution, under which Mr Rajoy would be able to suspend Catalan autonomy - possibly immediately, or bit by bit. Article 155 has never been used before, so we are in a kind of Brexit situation before Article 50 was triggered. The article legally exists but there are disagreements about how far-reaching it is, how it would/should work (and how quickly) in practice. Reports in Spanish media have suggested that if the Spanish prime minister were to activate Article 155 in the absence of a response from the Catalan president, pro-independence parties in the Catalan parliament would then declare independence. The leader of the opposition Socialists, Pedro Sanchez, told reporters that his party and the government had agreed to examine the possibility of using constitutional reform to end the crisis. This would be focused on "how Catalonia remains in Spain, and not how it leaves", he added. Addressing the Catalan parliament in Barcelona on Tuesday evening, Mr Puigdemont said the autonomous region had won the right to be independent as a result of the vote. He urged the international community to recognise Catalonia as an independent and sovereign state. He said the "people's will" was to break away from Madrid but he also said he wanted to "de-escalate" the tension around the issue. With this in mind he announced that he was "suspending the effects of the declaration of independence" for more talks with the Madrid government, which he said were needed to reach a solution. He and other Catalan leaders then signed the declaration of independence. It is not clear if the declaration has any legal status. Crowds of independence supporters in Barcelona cheered Mr Puigdemont's initial remarks but many expressed disappointment as he clarified his stance. Catalonia is is one of Spain's wealthiest regions but a stream of companies has announced plans to move head offices out of the province in response to the crisis. The European Union has made clear that should Catalonia split from Spain, the region would cease to be part of the EU. Secessionist allies piled pressure on Catalan President Carles Puigdemont to formally declare independence from Spain as a deadline looms for him to clarify his stance or face being stripped of his powers by the central government in Madrid. CUP, a radical party that’s part of Puigdemont’s pro-independence coalition in the Catalan parliament, published a letter on Friday saying that the only way to protect democracy and civil rights would be to proclaim a republic. The Catalan National Assembly, a separatist civic group that organizes street protests, also called on him to go ahead with a declaration of independence. The clock is ticking in Catalonia toward an Oct. 16 deadline set by Spanish Prime Minister Mariano Rajoy that risks triggering the suspension of self-rule from Barcelona. Rajoy, who reviewed the troops at a military parade in Madrid on Thursday to mark Spain’s national day, is turning the screws on Puigdemont as he tries to hold his coalition together in the face of threatened legal reprisals for challenging the country’s constitutional order. Hernando said he “wasn’t very optimistic” about Puigdemont’s response because he has already taken the region to a state of confrontation that had resulted in more than 400 firms being “expelled” to other parts of Spain. In a speech to the Catalan parliament on Oct. 10, Puigdemont claimed the right to declare independence but stepped back from putting it into effect as he called for dialogue. Rajoy responded the next day by demanding that the Catalan president clarify his position on the independence declaration or face a possible suspension of the region’s autonomy beginning Oct. 19. Spain’s benchmark IBEX 35 stock index was little changed at 4:55 p.m. in Madrid, after losing 2.3 percent between an Oct. 1 referendum on independence illegal under Spanish law and Puigdemont’s address to lawmakers. Puigdemont must now decide whether to take the path of further confrontation with Madrid or risk losing his allies in Barcelona. Deputy Prime Minister Soraya Saenz de Santamaria said the government may have to consider revising its economic growth forecast for 2018 if the Catalan crisis continues. “The situation we’re living through in Catalonia prompts us to be more prudent,” she said in a news conference after a cabinet meeting in Madrid on Friday. The Catalan government still has time to return to legality but any negotiation would have to be within the framework of the law, she said. It comes after Spanish prime minister Mariano Rajoy threatened to impose direct rule on Catalonia unless the region’s leader Carles Puigdemont retracts by 10am CET an ambiguous declaration of independence he made last week. Puigdemont declared independence following a referendum but then suspended it and called for talks with Madrid. Rajoy is likely to impose article 155 of Spain’s 1978 constitution, which allows him to take control of a region if it breaks the law. Jordi Sánchez and Jordi Cuixart are not well-known names in Europe, or even in Spain. But the two wield extraordinary influence in the tense drama now unfolding in restive Catalonia. Because in a few short hours, through their organizations and networks, with a tweet or a text, the activist duo can put 100,000 people on the street. It was this remarkable ability to stage some of the largest peaceful demonstrations in Europe — and the power of their message promoting a democratic and independent Catalonia — that steered the two toward an almost inevitable collision with the central government in Madrid. Sánchez and Cuixart, who both espouse nonviolence, are now sitting in jail cells at the Soto del Real prison in Madrid, held in preventive detention, without bail, on charges of sedition against the state, which carries a maximum sentence of 15 years. They were arrested Monday as part of a government crackdown that seeks to stifle the secessionist movement in Catalonia. Spain’s prime minister, Mariano Rajoy, has called the independence movement and its leaders reckless, even dangerous, rebels. Their chaotic independence referendum earlier this month was deemed illegal by Rajoy and constitutional judges. Riot police were ordered to stop it, producing wild scenes — beamed around the world — of officers whipping citizens with rubber batons and dragging them away from ballot boxes. The Spanish news media outside Catalonia has generally viewed the pair as skilled troublemakers, misguided at best, but worthy of respect because of their clout. Cuixart, 42, is a dashing figure who favors black leather jackets. A high school dropout, he is a self-made man who founded a successful business that exports packaging machinery. He leads the Catalan group Omnium Cultural, which backed the independence referendum. Sánchez, 53, looks like the rumpled university professor he is. He teaches at the University of Barcelona and is president of the Catalan National Assembly, which is not an elected body but a pro-independence group that boasts about 80,000 members. Compared with Sánchez and Cuixart, regional politicians in Catalonia are amateurs at the art and science of mass mobilizations, according to the Spanish news media. Their wives told The Washington Post that they had not been allowed to visit their husbands in prison but that they had spoken with them by telephone. Their wives say that the two men remain strong but that sedition is a serious charge at such a highly politicized moment. They worry that their husbands are being held hostage. “The lawyers cannot say how long, but they tell me, get ready, this could take time,” said Susanna Barreda Cortiella, the wife of Jordi Sánchez. She recalled that as a young man, he refused compulsory military service. When offered alternatives to avoid punishment, he declined, Barreda said. She said he burns with a passion for an independent Catalonia. “They went after them first, because it’s easier to arrest two civil society leaders than to jail elected officials or the chief of police,” Barreda said. The showdown in Catalonia edged toward constitutional crisis this week, following the central government’s announcement Thursday that it would move quickly to assert control of the autonomous region after its president refused to end his push for independence. Rajoy, the prime minister, will convene an emergency cabinet meeting Saturday to begin the unprecedented process of invoking Article 155 of Spain’s 1978 constitution, which would allow Madrid to seize control of the autonomous government in Catalonia, including its finances, public media and police. The sedition charges against the two men arise from a Sept. 20 demonstration outside the Barcelona offices of the regional vice president and the Economic Ministry. Members of Spain’s Civil Guard police entered the building, arrested 14 employees and minor officials, and seized documents that authorities say were to be used to stage the illegal referendum. At one point, Sánchez and Cuixart jumped on the roof of one of the cars and addressed the crowd, eventually urging them to leave the area peacefully. 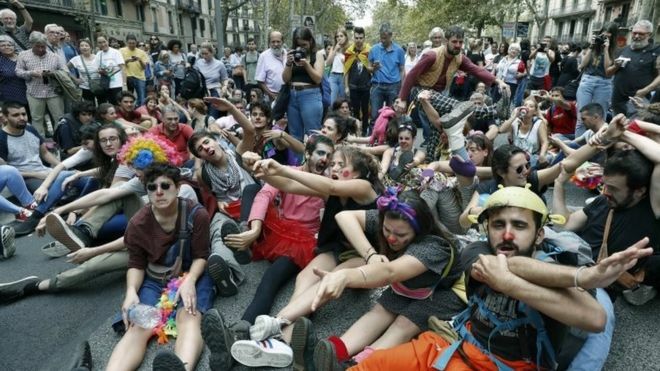 The leaders pride themselves on organizing mass protests that proceed down Barcelona’s elegant streets without incident, their progress coordinated with regional police. “So now my husband is in jail, and I feel sad for him,” said Txell Bonet, Cuixart’s wife. The arrest of the two secessionists may give Spain a black eye in Europe, but so far the European leadership has backed Madrid, decrying the police violence but also insisting that the referendum was illegal and remains an internal affair. Pro-independence activists, overall, seem anxious about what happens next. But they think they will ultimately prevail. “We have a big problem. Spain has a huge problem,” Oriol Junqueras, vice president of the Catalan regional government, told The Washington Post. He said the arrest of the two activists only stokes anger and bolsters the case for independence. Junqueras said the two have been scrupulous and relentless in their message of nonviolence.